As a committed corporate citizen and one of the largest employers in South Africa, we continue to support and empower the individuals, businesses and communities we serve. We acknowledge that transformation is key to long-term growth and sustainability and while scorecards and good B-BBEE ratings play a vital role in accessing opportunities it remains only a benchmark and measurement for change that happens beyond the tick-box framework. The past year has seen proposed and implemented amendments to B-BBEE regulations and legislation. The amended Preferential Procurement Regulations (2017), the proposed changes to the Mining Charter as well as the new reporting requirements for JSE listed companies and the B-BBEE Commission are in full force. These new and proposed changes will influence how we engage as business in South Africa and ensure our compliance as a listed entity. We are cognisant of the fact that If we are going to achieve transformation in a way that strengthens our businesses rather than burden it with legislation, there has to be a more collaborative and inclusive approach between the private sector and government. As a leader in business we will continue to be proactive and lead by example. We are clear on the fact that our success in securing business growth and sustainability hinges on our ability to critically assess and overcome the current challenges by identifying different ways of doing business. We view our relationships with customers and suppliers as key and a platform for more strategic solutions and partnerships alike. While the economic outlook is not as favourable as it was a few years ago, we will continue to advance in transforming our status and impact as a corporate citizen. In line with the decentralised operating model of the Group, every subsidiary business acquires its own B-BBEE rating that it uses to operate and trade. 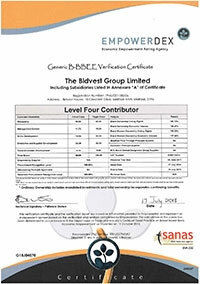 So, while the Bidvest Group achieved a commendable level 4 B-BBEE contributor status, at least 75% of the individual subsidiary businesses achieved between a level 1 and a level 4 rating. Our objective is not only to improve on this in the year ahead but also to focus on long-term, scalable and sustainable solutions for social and economic transformation. Management diversity remains top of mind to encourage inclusivity and different ways of thinking. We know that a diverse leadership team and employee base will foster innovation and stimulate an environment within which everyone can thrive. Various leadership interventions across the Group, for example the Bidvest Academy and Executive Development Programmes, bode well to prepare young, diverse leaders for the future. Tackling the challenge of youth unemployment, currently estimated at 57%, remains high on our agenda and is addressed via increased investment in skills development, learnerships and internships and where possible, the absorption of such individuals into our businesses and the industry in general. Building capacity in technical skills is high on the agenda for all businesses. Many of our existing facilities have been ramped up to accommodate this need. Transforming our supply chain is crucial, although challenged, by a burdensome legislative environment that impedes the development of SMMEs. Sourcing suitable black-owned SMMEs is a priority. Efforts in this regard have been ramped up significantly. Code practices are not aligned with business practicalities. Bidvest has long since acknowledged that long-term, strategic solutions are required to gain substantive change.